How long have you been cosplaying? 4 years. What characters have you cosplayed? I have cosplayed as Mr. 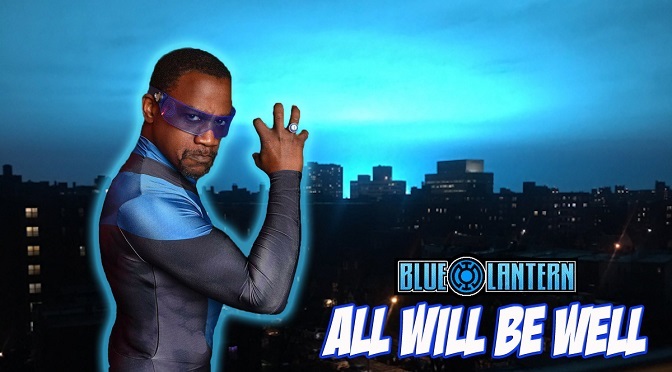 Terrific and Blue Lantern from DC Comics, and I cosplay as at least 4 different versions of the Falcon from Marvel Comics. What inspired you to start cosplaying? My oldest daughter. As a face and body artist and lifelong comic book fan, the idea of cosplaying always fascinated me, but it wasn’t necessarily something that I thought that I’d ever do. That changed, when my daughter who was 14 at the time, and was making her own clothes, wanted to make a superhero costume and wanted ideas as to who she could be. From there, I decided that if she was going to start cosplaying, then I’d join her. What do you do when you are not cosplaying? When I’m not cosplaying, I enjoy fishing, bowling, reading comic books, and playing video games with my daughters. What is the best advice you would give someone new to cosplaying? Make sure that you are cosplaying for the sheer enjoyment of it. Don’t do it for “likes”, “clicks” or popularity. If you don’t get those, then it won’t be worth it for you. If you’re doing it because it’s fun, and you enjoy it, then the “likes” and “clicks” won’t matter. Also be cognizant that not everyone is going to love everything you do. They’re not going to love every costume you make. Remember that you’re not cosplaying for them. And nobody but you gets to decide whether your cosplay is good or not. That’s up to you. Because Diversity matters. We still live in an age where in our country, Caucasian is seen as the default/normal race. As a result, People of Color are grossly under-represented in all aspects of our society, to include cosplay. Too many non POC fail to recognize this, and would rather that POC see ourselves in THEM, instead of simply showcasing cosplayers of all colors. Young POC are STILL being told that they can’t be certain things in society. It’s incredibly important for young children of color to actually see US and to see that they CAN be whatever they want. Even more importantly, WHITE COSLPAYERS NEED TO SEE US. They need to see that we exist. Not as an abnormality, or as an aberration, but as a completely equal participant in this thing that we call cosplay. They need to see that we CAN and WILL stand on the same stage as our white counterparts. Not as the “Black Version” of a character, but simply as that character regardless of their race. What is one thing the PoC cosplay community can do better when it comes to dealing with each other as well as non PoCs? The POC cosplay community can begin being the cosplayers that we want our non-PoC counterparts to be. By that, I mean that we need to cosplay without forming the cliques, the hierarchies and the fiefdoms that we see in the larger cosplay community. We need to cease judging other cosplayers on those things that only serve to alienate us from each other, and work at being a more INclusive group. We need to make sure we set that example even within our own ranks. In dealing with non-PoC, we need to be un-apologetic about what we stand for. We don’t need to ask permission to share the stage. It’s our stage too, and we need to make sure that they understand that we will not be silent or subservient when it comes to issues like racism, homophobia, body positivity, sexism or misogyny. We have to be the advocates that we need.